3AW Top Choice – The Residences.. Looking for a retirement lifestyle with the perfect inner city location? The Residences at Rathdowne Place by Australian Unity ? designed by internationally acclaimed architects Fender Katsalidis? with spacious kitchens and bathrooms, and premium appliances and inclusions. and specialist retailers, and less than 3 kms from Melbourne’s CBD. 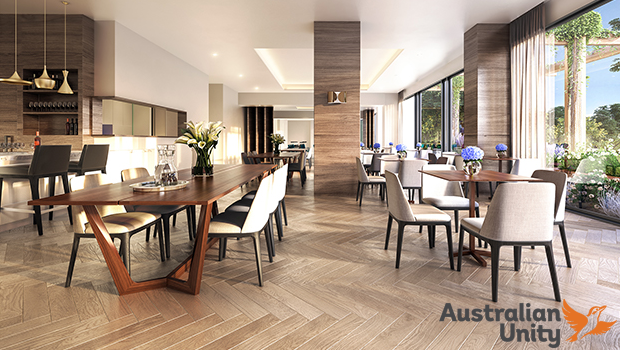 The Residences offers access to Australian Unity’s suite of in-home services ? including cleaning ? allowing you more time to do the things you love doing. Greet the day with views from the rooftop garden terrace before enjoying the on-site gym, cinema or meeting friends in the piano lounge and bar. Or head out for the day in The Residences’ chauffeur-driven town car. and construction is well underway. More than the place you live, it will be the place you love.